I have a couple ideas. I have a lot of ideas for modules, but I've been having trouble committing to a specific size. The dilemma is I want a layout to run my 8 car bullets, but I am also trying to balance the practicality and available space. I've been playing with the idea of cutting a 4x8 sheet into 2x4 modules. The end modules would be 2ft wide by 4ft deep to support the 180* curve. The middle modules would be 4ft wide by 2ft deep. It would allow me to get a second 4x8 to split into 2x4 modules for adding onto the middle. Essentially creating a modular layout with a minimum length of 8ft and expandable to 12ft or 16 ft.. or more. I would have at least 4 tracks - Tomix double overhead for the shinkansen, Kato concrete tie double track ground line and maybe a single track wooden tie line weaving along as well. Smaller T-trak style board modules. Easier, cheaper and faster to build, but running 8 car bullets on it would not be very satisfying. Either way, I know I want to do some "Manufacturer Display Modules". Do a module exclusively of Kato, one of Tomix, Tomytec, and Greenmax.. as a way of showing off what each manufacturer has to offer. Assuming my layout ever made it to a train show. My other option is a hollow-core door layout. It would be a simple rural line. The layout double-sided using the Kato rural station on one side and creating a generic rural scene (bridge, rice fields, thick greenery) on the other side. A door layout would be completed and operation much sooner than my modular idea. The big downfall is a door layout will not be big enough for my bullet trains. Should I invest the time/effort/money in a layout that I can actually run this summer.. or do I invest that time/effort/money into a modular idea that will probably not be operational until at least next year? After much debate, I've come to a conclusion. I have been tasked with installing shelves over a wall in our bedroom. The shelves will be about 355mm x 2700 (14in x 9ft) and primarily tasked to provide storage for the girlfriends manga & anime collection. The shelves will be floor to ceiling, so there will be 8 to 10 shelves in total.. I haven't figured out the height spacing just yet.. Layout will use Tomix C140mm curves & maybe some Wide Tram. Rolling Stock will be B-Trains, Trams and 2 axle freight. I'll be playing around with track placement today. I'll try and have a track plan posted this week. 2.7m is indeed very long! It will give you some room to play with. I'm sure the result will be interesting. Umm will flexible track like that? I know what you mean. When we moved into our first house (last year) we agreed to turn one of the common rooms into a library. I've built 16 shelves over 3 of the 4 walls (4th wall is a bank of windows) and she has already filled those shelves up! This cleared out maybe 1/4 of the boxes she has. I'm doubtful the shelves I'm building in the bedroom will be enough.. but it will at least get rid of some (hopefully most) of the boxes filling our upstairs room. I won't be using flex track, I'll be using Tomix Supermini track. I plan to keep the main lines at 140mm - which is enough to run trams, B-Trains and some smaller trains like my Kiha 120s or some short 2 axle freight. Well there's no reason to throw the baby out with the bathwater. You can still use flexible track for broad, sweepy curves in between R140 turnarounds at the ends. For the record, Tomix 140mm radius is Mini, not Super-Mini (which is only the 103mm radius). See the icons on the packaging. Don't feel bad -- Plaza Japan gets this wrong all the time. Still doing some final adjustments on my layout design. A few more pieces of track will need to be ordered. Module 1 will have 2 tracks, an inner independent loop and the outer half-circle to be connected to the other module in the future. The layout looks a little plain, but I plan to incorporate some elevation changes between the tracks for added interest. Any thoughts or criticisms are welcome before I place my final track order later this week. Sorry for not updating sooner. My kitchen remodel has been delayed twice and is taking longer than expected. The house is 120yrs old, and over that time frame some of the previous updates to the kitchen used "shortcuts" that have made it a real pain to get down to and restore the plaster walls. Also - the main waterline leading into the house has a crack and needs replaced. The pipe is so old and corroded that it's not repairable. I'll be spending $2,000 to have them dig a trench in my yard and install a new main line to the house. With all these unforeseen issues and now a restricted budget, I will have to alter my project party plans to utilize the track and structures/scenery that I currently have. Not sure what I'm going to do just yet. Considering a container yard or a t-trak module. Will update soon with my new project. So, with all the distractions around the house I did not think I was going to be able to work on this project. Yesterday I found a scrap 2x4 sheet of plywood. I realized, a quad length t-trak module is roughly 4ft.. I worked up a quick idea, and built a quad-length t-trak module with a built on backdrop and sides. It's an idea I took from pictures I've seen of the Tomix modular display. 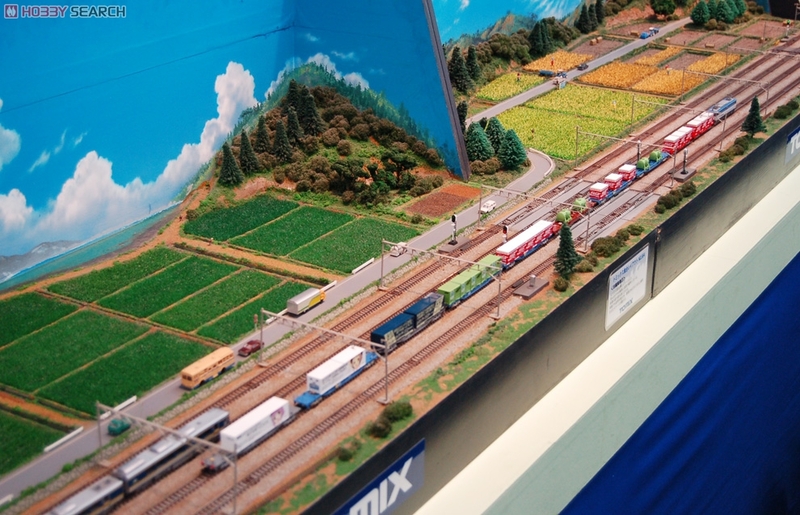 The Tomix display is much more like N-track (maybe even is N-trak?) but I like the way the backdrop wraps around the sides and angles down.. so I have built that into my T-trak design..
Pics of my progress shortly (once I find my camera charger) but here's a picture of a Tomix module with it's backdrop that wraps around the sides. Interesting approach. I like the idea of partially wrapping the backdrop like that, and I'm looking forward to seeing photos of what you've done.